It’s one thing sculpting a 36cm tall figure. It’s quite another thing to sculpt a 7ft 5in figure. So how do you scale it up? Some sculptors harness digital technology and have their maquette scaled-up in polystyrene, just adding the final few centimetres in clay themselves. My approach is traditional and may be considered rather ‘old school’ now. But I think it makes for a better quality sculpture. I start from the size I want my final sculpture to be. To have sufficient presence on the huge Western Concourse at King’s Cross station, we want the sculpture to be 20 per cent larger than life. Sir Nigel was a tall man, around 6ft 2in. This means I need the final bronze statue to be around 7ft 4in. There is likely to be a bit of shrinkage in the casting process, so I want a clay figure that’s slightly larger, ie 7ft 5in. This is where my trusty calculator comes in. I convert everything into centimetres. 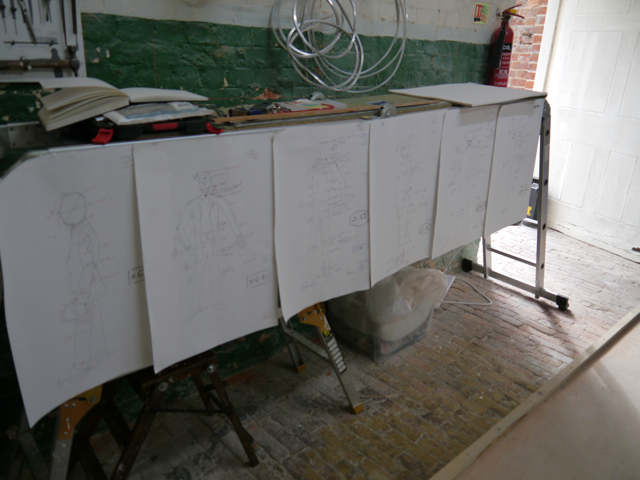 I now have to work out how many times larger than the maquette the final sculpture will be. The answer is just under six and a half times larger. So this is my scaling-up ratio. For every one cm of my maquette I need in fact to sculpt 6.3 centimetres. Sir Nigel’s arm on the maquette is 12 cm down to the wrist, so I have to sculpt his arm 76 cm long, on the larger-than-life sculpture. I find it easier to draw the maquette on a large piece of card and add the actual measurements and add the scaled-up measurements next to them. But nothing is ever quite this simple. As you can see from the photo I end up with a range of drawings pinned up in my studio – scaling-up from the maquette but also scaling-up from my sitters/models. And the sculpture evolves, so sometimes, at a larger scale you need to alter the ratio so the sculpture has more presence – for example further enlarging the hand and the head. You can only decide this once you are sculpting at size. The next step is to start building the armature based on the scaling-up measurements.